Great insight into a great person! What an interesting life! Slammin' hip hop soundtrack will have audiences kickin' it in the front seat or the back. Just ok as a movie-not sure the story was interesting enough to pay the cost of a ticket. Accurate, funny, witty and historically accurate. RBG (herself) is inspiring. This movie is a real upper in a time of tension and chaos. One of the best films of any type that I've seen in a long time. 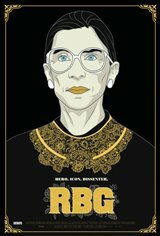 Notorious RBG proving good things come in small packages. Inspirational! very well documented excellent film. Quite possibly one of the most destructive forces on the SCOTUS. Her rulings have done nothing but hasten the decline of civilization.